Throwing line is now High Viz Yellow 1.8mm paracord. I like to call it the Flee Bag…get it? This is a 40m to 6m antenna system using the lightest weight components without sacrificing durability or convenience. Like my other very popular end fed antenna this is a lighter version which includes a excellent throwing line and small gauge wire antenna combined with ultra light UnUn and coax. Total weight including everything is 23 oz. 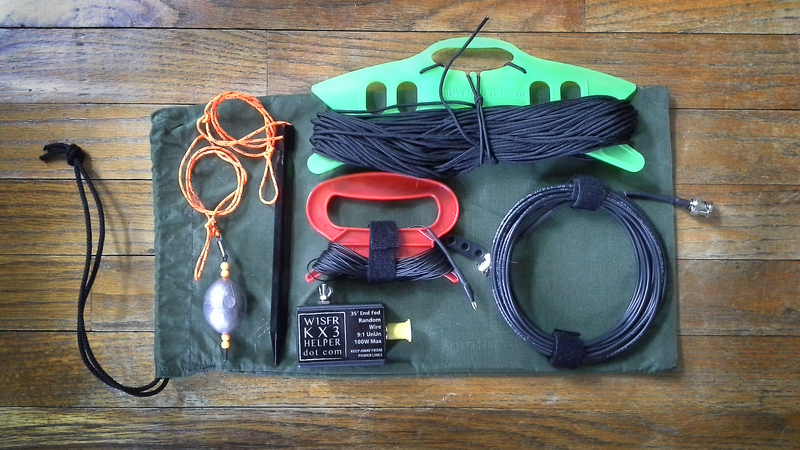 Here’s what’s in the genuine US Army drawstring bag with plenty of extra room for stuff. 35′ of Davis RF 26ga “silky” antenna wire with #10 ring terminal and light weight insulator. All sealed with dual wall adhesive heatshrink on each end.